Last August I signed up for an online class called “Of Towers and Turrets”, a wonderful melding of mixed media collage with metalwork and resin, taught by Sharon Tomlinson and Deryn Mentock. I wrote about the first step here, creating my collage. Once my collage was created, I started work on my metal Towers pendant, which taught me about cutting metal shapes, soldering filigree and bezel wire as well as riveting, all new techniques that I was quite excited to add to my jewelry making repertoire. Once the pendant was crafted, I chose a part of my collage to display. As this was the first face I’ve ever painted, the choice was easy! Once she was cut out and gently placed in my bezel, I carefully covered her with Ice resin, a product I’ve never used before and absolutely love now. It’s tricky mixing it up, adding just the right amount to the bezel and then getting rid of all of the tiny bubbles but the results are so worth it. A desk lamp placed right over my pendant got rid of all of the bubbles very nicely. The heat of the light bulb draws up the bubbles so they can pop. 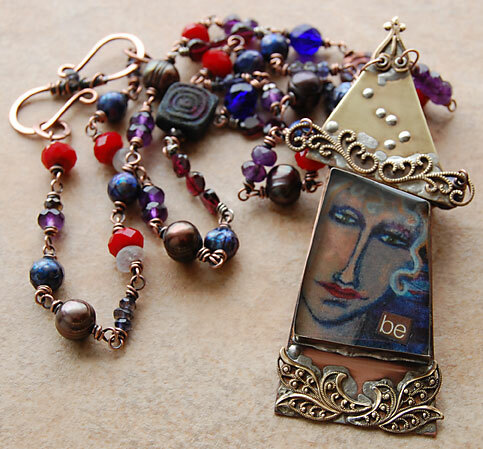 Once the pendant was complete, I decided to create a necklace using deep purples, reds and blues to bring out the colors in my pendant image. My goal was to create a richly colored necklace full of facets and sparkle. I chose amethyst, iolite, garnet, pearl, crystal, moonstone and 2 raku beads. I wire wrapped each bead, adding them on one at a time. Creating a necklace in this fashion is very tedious and time consuming but gave me just the look I wanted. The S-clasp was crafted from a thicker wire and then wrapped with a thinner wire coil and an iolite bead. It took me 5 months to complete this process but it was an amazing journey that taught me so much about myself. 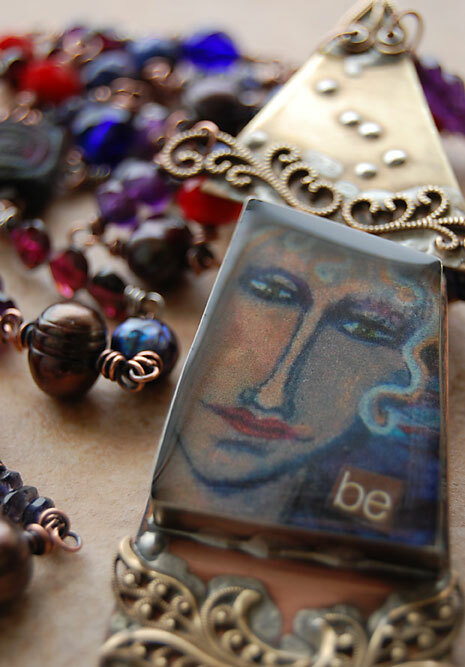 This entry was posted in Beads, collage, Color, Creativity, Jewelry, mixed media, My Studio, Photography, Stones and tagged Ice resin, mixed media jewelry, necklace, resin pendant, Towers and Turrets. Wow, Wow, Wow, Wow!!!! I am absolutely impressed!!! 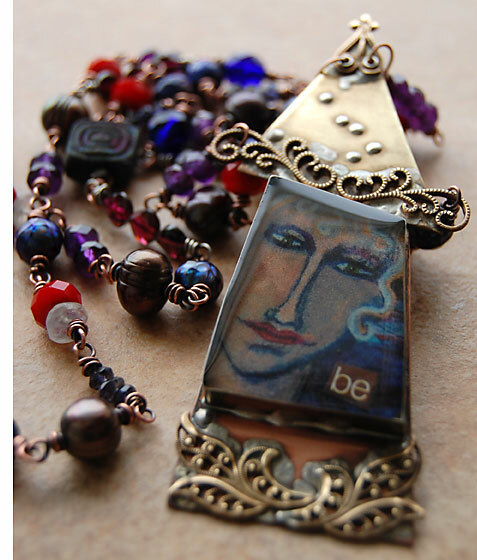 I have a confession…..I took this class as well and never completed a pendant. 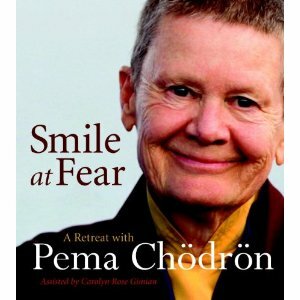 Although I did learn many fabulous techniques – I did love the class! You should be so proud of yourself…you did it ALL from start to finish! And it looks like your resin turned out perfectly! I have no words to express how beautiful this is… more amazing in person.. believe me. Stunning. Thank you, dear Judy, for your sweet words. I think this is one of your most beautiful pieces Karen. It is even more lovely in person. So happy I got to see it, hold it and admire it. Wear it proudly. Thank you SO much, Amy. Your kind words and support mean so much! This is great, Karen! Haven’t tried the resin yet, but I will eventually. Thanks Arline! Have fun when you give it a try! Hi Deryn! Thanks so much – your feedback means a lot! And a big thank you for all of your inspiration. Beautiful work Karen! I just finished The Build Zone workshop and loved it. Time is crunched for now, so the T&T class was not viable. However, I am plugging away and still practicing and perfecting the techniques I just learned and will do the T&T as soon as possible. Love what you made and thanks for sharing.